Ataxias are a group of disorders that affect coordination, balance and speech. They may result from damage to the cerebellum, the basal ganglia, the spinal cord, or the peripheral nerve pathways that are related to motor movement. Parkinson’s disease is a common movement disorder characterized by lesions in the basal ganglia, predominantly in the substantia nigra. The amphetamine-stimulated locomotor activity (Amphetamine-stimulated LMA) assay is used to evaluate the behavioral response elicited by i.p. injection of amphetamine. It induces psychotic symptoms via an increase in dopaminergic signalling and is relevant to neuropsychiatric disorders. 3mg/kg injection into C57BL/6N induces locomotor activity. Dose is maintained below saturation in order to see both increased and decreased amphetamine sensitivity. Gait analysis evaluates proprioceptive sensitivity but also assesses the integrity of motor coordination and vestibular function. Animals require an accurate paw placement to succeed in this test. The gait is altered in in different pathologies including ataxia or neuropathic pain. Digigait™ (Mouse Specifics, Inc.) transparent treadmill instrumentation. 10 mice per group are recommended for reliabe data analysis. The balance beam test or gait analysis is relatively specific for evaluation of proprioceptive sensitivity. However, the performance in this test also depends on the integrity of motor coordination and vestibular function. An elevated beam of standardized diameter and length. 10 mice per group are recommended for reliable data analysis. This test measures the muscular muscle strength using an isometric dynamometer connected to a grid. Once the animal is holding the grid with its forepaws it is slowly moved backwards until it releases it. The dynamometer records the maximal force exerted. 2 grip strength apparati (BIOSEB, Vitrolles, France). 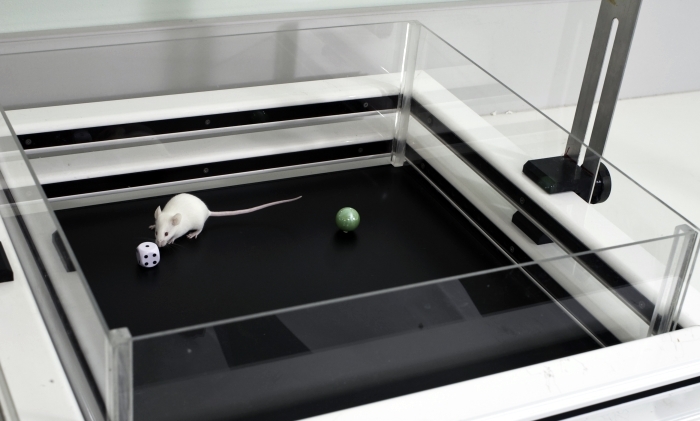 The MoRaG test consists of a semiquantative and quantitative assessments of reaching and grasping behavior in mice. These fine-tuned motor abilities are altered in neurological diseases such as Parkinson’s disease. In this test, mice submitted to food restriction are forced to use a single paw instead of their mouth in order to get a small food pellet. A proprioceptive test similar to the balance beam under more challenging condition requiring vertical as well as lateral movement. This test also depends on the integrity of motor coordination and vestibular function. The one-meter swim test is used to evaluate swimming ability of mice. A straight swim tank (100 cm long, 6 cm wide, 27.3 cm high) made of translucent PVC and filled at 21 cm depth with water. A visible platform is placed opposite to the starting point, allowing to the animal to escape from water. This test measures the ability of an animal to maintain balance on a rotating rod. This task requires a variety of proprioceptive, vestibular and fine-tuned motor abilities. The string test measures the time required for a forelimb-hanging mouse to gain hindlimb traction. Defects in latency time reflect potential alteration in traction force, drug-induced sedation, or deficient coordination (Meziane et al. 1996). Customized equipment: a wire stretched horizontally 40 cm above a table. Under constant environmental conditions, mice demonstrate circadian and ultradian periodicity of activity and feeding behavior, which is driven by an endogenous clock located in suprachiasmatic nuclei in mammals. Measurement of spontaneous activity and food/water intake allows evaluation of biological rhythm and sleep abnormalities. Strain comparison between C57BL/6J and 129/SvPas over 32 hours with noted hourly measure of locomotor activity. Light and dark phase intervals are noted. Food and water measures are made concurrently. Calorimetry cages allow the simultaneous measurement of energy expenditure, ambulatory activity as well as food and water intake. Energy expenditure is evaluated through indirect calorimetry by measuring oxygen consumption with an open flow respirometric system. It also monitors CO2 production, thus the respiratory exchange ratio (RER) and finally heat production can be calculated. Infra-red frames are integrated to the system in order to measure ambulatory activity. A food intake monitoring system is also integrated for the measurement of feeding/drinking behaviors. Experiments can be performed from 24h to 5 consecutive days. The test can be conducted at different ambient temperature (4°C to 39 °C) and the cages allow one to performing food and drink restriction procedures as well as food or drink preference assays. See our Indirect calorimetry dedicated section for more details. This test is used to evaluate exploratory drive, reactivity to novelty and emotionality. Habituation to the open field, which is a form of non-associative learning, is also measured. Mandillo S, Tucci V, Holter SM, Meziane H, Banchaabouchi MA, Kallnik M, Lad HV, Nolan PM, Ouagazzal AM, Coghill EL, Gale K, Golini E, Jacquot S, Krezel W, Parker A, Riet F, Schneider I, Marazziti D, Auwerx J, Brown SD, Chambon P, Rosenthal N, Tocchini-Valentini G, Wurst W.
Reliability, robustness, and reproducibility in mouse behavioral phenotyping: a cross-laboratory study. Physiol Genomics. 2008 Aug 15;34(3):243-55. Epub 2008 May 27. 4-8 automated openfield arenas (Panlab, Barcelona, Spain). We perform multi-derivation ECG heart in anesthetized mice with 8 probes to generate information about how the electrical activity propagates in 3 dimensions and to determine the electrical axis of the heart. Axis deviations may result from cardiac injury or from a congenital defect. Electrical heart axis difference and specific electrical transmission issues are determined by multiderivational ECG. Multiderivational ECG profiles of a wild-type mouse (left) and mutant mouse (right). Deviated profiles in the mutant animal suggest a left-heart contraction deficiency as well as rotation of the electrical axis to 90-120⁰ from the normal 30-60⁰. Electrocardiograph ISO DAM8 amplifier (World Precision Instruments, Sarasota, USA) with ECG AUTO v3.3.5.5 (Emka technologies, USA) and 8 lead positions probes.